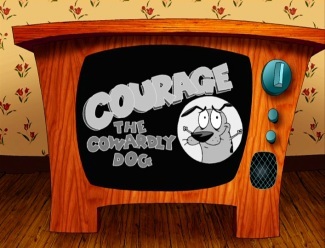 Reading into Things: Courage the Cowardly Dog | G.O.N.G. So, I remember writing something about how I felt about how the gang in Scooby Doo got together: Freddy and Velma realize that they both like mysteries and invite Freddy’s girlfriend, pot supplier, and the pot supplier’s dog (Daphny, Shaggy, and Scooby respectfully) to break into a house to solve a mystery. Well, my good friend, Sam brought up one day that he believed that Courage the Cowardly Dog is set after the awakening of Cthulhu, hince the insanity of the world and why no-one seems to notice. So, I’ve decided to run with this idea. Years ago, Eustice, Muriel, and Horst (Eustice’s cool adventurer older brother that gets mentioned a few times in the show) were all occult detectives in their youth. Unfortunately for them, they were alive when this guy decided to wake up. Cthulhu’s awaking spreads mass chaos and madness into the land, causing Eustice, Muriel, and Horst to try and stop it from spreading wherever they could. Eventually, they get pushed back to Nowhere, Kansas. Nowhere happens to be an epicenter of Cthulhu worship and the trio get stuck trying to save the townsfolk from the corruption. 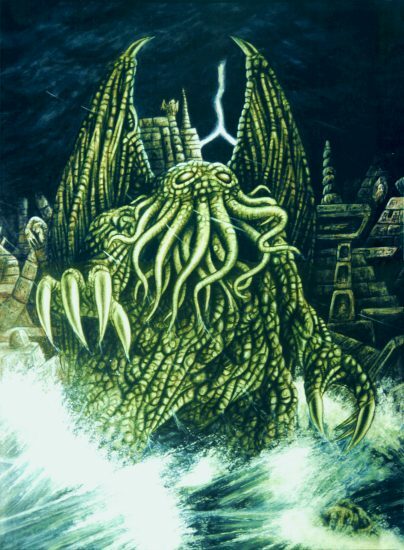 Unfortunately, the Nowhere cultists were the one’s who had originally succeeded in awaking Cthulhu and the trio’s efforts to thwart them had accutally helped hasten his awakening. Soon the Elder God corrupts humanity and the trio becomes a duo, as Horst dies saving Eustice and Muriel from being killed by the various abhorent monstrosities shambling upon the earth. Grief-striken over the death of Horst and their failure to keep mankind from being destroied by Chtulhu, the couple deciede to let death take them by settling down in Nowhere and waiting for the enivitable. However, there is one of the Outer Gods who decides to “reward” them for reawaking their high priest. The malevolent Creeping Choas himself decides to not grant their wish for a long time, allowing them to grow old, unmolested on their barren farmland. He even taunts them of their failures by making the television they have play nothing but perversions of the world that use to exist (hence, whenever you see something other that the news on their tv, it’s always a live-action man in cartoonish situations) For decades, they wait for a death that doesn’t come, and being to shameful to commit suicide, they soon fall into a state of perverted normalcy. They would live their lives as if there weren’t terrifying horrors from beyond time and angled space roaming the land. However, as they reached their old age, they decide to let the sins of the earth do what they will; should some madness rip at them, they will allow it to. This underlying death wish gives old Nyarl an idea, and he creates a portion of himself into a creature of irony. Courage. A cowardly, pink, male dog capible of sentient speech and action, not to mention shape shifting, and near-supernatural resistance to harm. 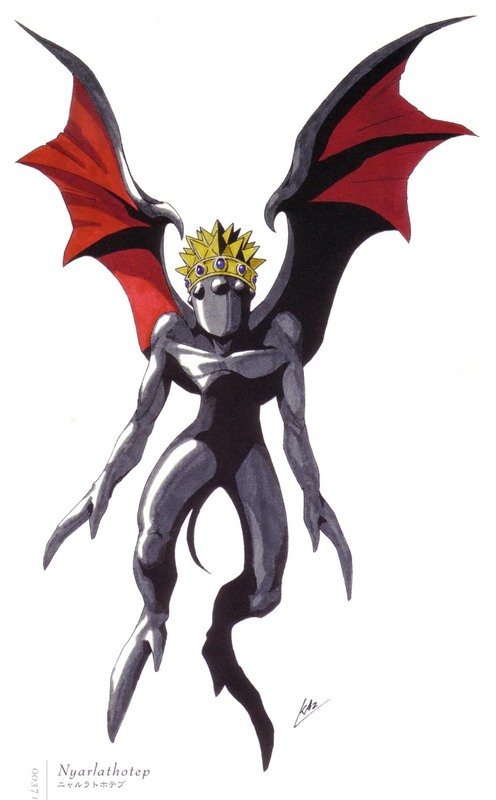 Courage is an aspect of Nyarlathotep, given by “fate’s” hand to the Bagges, so that the terrors of dead Earth could find them and torture them. However, so long as Courage was there to thwart the evil, the Bagges would never know death. Even if corrupted into abhorent forms themselves, they return to how they’ve always been. Their obliviousness to the insanity of their world is just a coping mechanism wrapped in a death wish. Courage is their unwitting jailer in a hell of corrupt damnation, even though parts of him know what he really is and what he was made to do. 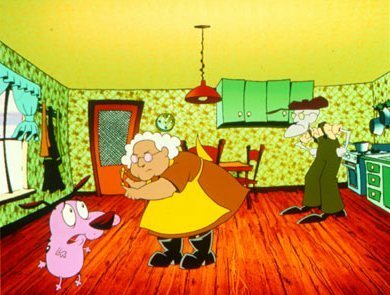 Now, go and rewatch Courage the Cowardly Dog. You’ll forever see it in a different light. « Spectacular Gong Stories #4 – For Whom Do the Angels Cry?